The project aimed to improve the value recovered by peeling low-grade native forest hardwood. It also aimed to define recoveries, characteristics and value from key eastern Victorian eucalypt species currently not peeled commercially, namely: Eucalyptus sieberi (Silvertop Ash), E. cypellocarpa (Mountain Grey Gum) and E. obliqua (Messmate or Brown Top), which are also found in southern New South Wales. The project examined the value and recovery from Tasmanian oak species Eucalyptus obliqua, logs currently graded for the pulpwood market will be peeled to assess their potential to produce veneer. 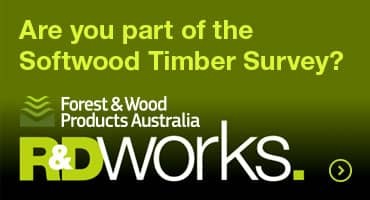 Examine the potential to manufacture plywood panel products from the low grade logs from eucalypt species selected in this trial. Determine if the low grade logs under study have the desired structural properties for processing of veneer that can be utilised in high stress grade plywood panel products. Examine the potential for log, billet, and veneer segregation and batching for optimal processing efficiencies. Determine the effectiveness of log and veneer batching strategies to assess the potential gains that can be made in plywood production. Trial logs were supplied to Ta Ann’s Veneer Mill at Smithton and graded to a low-grade peeler log specification developed for this project by the company. The logs were rotary peeled for structural veneer. Vveneer stiffness assessment and segregation systems were used to sub-batch the veneer produced and the veneer was then visually assessed and selected for the production of plywood panels whose mechanical properties were tested to Australian/New Zealand Standard AS/NZS 2269.0:2012 Plywood-Structural Part 0: Specifications.